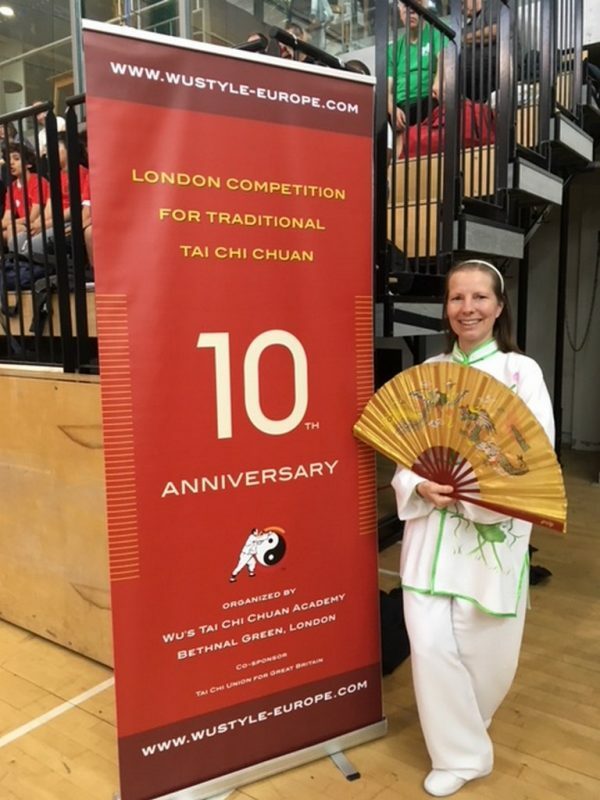 This year was the 10th anniversary of the London Tai Chi Chuan Competition. Gary Wragg of Wu’s Tai Chi Chuan Academy and his team put on another fabulous event in Hackney. I’m not sure how many times I have been but it is a few years since the last time. I travelled on the Saturday and stayed with my wonderful Tai Chi sister Vicky of the Chi Clinic. I decided this year that I would only compete and not judge as I have done in previous years. This turned out to be better as I could focus on competing. I entered four categories: Simplified 24 hand form; 42 combined competition form; 32 Yang style sword form and Mixed style Fan form. I am delighted to have got a gold in the fan section and silver in the 24 hand form. In both I achieved a personal best score. Although this is a competition, it is also a celebration of many different talents. All those attending are supportive and friendly. It actually doesn’t feel like a competition except when performing in front of 3 judges! The rest of the time there is plenty of opportunity to mingle with competitors and the judges are always more than happy to give you feedback on your form. If you are reading this and have ever wondered about entering a Tai Chi competition, I would highly recommend this particular event. The first competition I went to, I went only as a spectator as I wasn’t sure how Tai Chi would work in that set up. I went back a year or two later and competed . The purpose of competing was to take myself out of my comfort zone. I had no expectations in terms of being placed but I was going to be happy if I got through the routine without forgetting it and without falling over. My goals were achieved and so started my competition journey. Competing gives a particular focus to your practice and it is good to be scored so you have something to work on. Competitions aren’t for everyone but even if you are just a little bit curious maybe consider going next year just to watch and cheer on the competitors. There was plenty of opportunity for lots of photographs and I took a fair few myself. The photographs can be found by clicking here. If you would like to join one of our classes, we have a number of classes on different days and also in different locations.